Repeat with the other chain on the other end of the hinge. Find the center of the chain loop and attach one jump ring to the center link. Connect that jump ring to the clasp around your wrist! Grab two brackets and decide the length that you want between each of the L-brackets for the necklace. Count or measure out the two pieces of chain, making sure they are exactly the same on both sides. 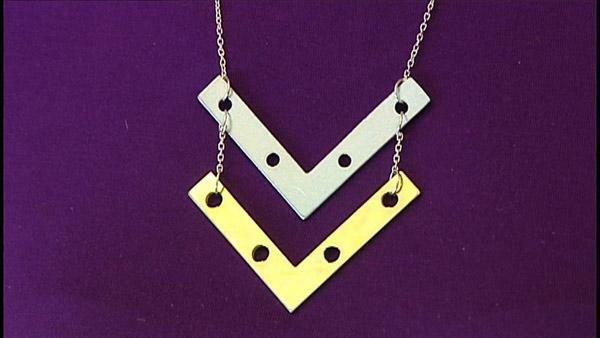 Next, decide how far you want your necklace to hang around your neck and cut an appropriate length of chain. Attach a jump ring to the end of the chain and then attach the top bracket. Do the same thing to the other side. Hold your necklace at the very top and let it hang making sure you get the absolute center link. Cut the link to open the necklace. Attach a jump ring to each cut side of the chain. Attach a clasp to one of the sides and you're done!